Blimey! Don’t pick your nose or you could get captured by pirates! 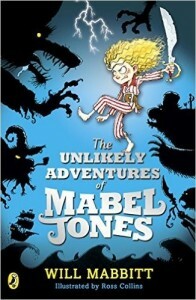 No matter how many times some children are warned, they still do it, Mabel Jones is one guilty girl. One minute she is wearing her pajamas and in her own bedroom. Then silence. Captured and plopped aboard a pirate ship, she is required to help find some missing treasure before the comet flies over if she has any desire of getting back home. This mismatched batch of pirates are hilarious. First, they are completely disgusted to realize their new crewmate is a girl. Until they realize she can read. Now they know she is brainy and can be of help to them. Even the strange creature who captured her ends up loving her, because she is kind to him. Everything about this adventure is entertaining and fun. Even the varying sizes of fonts make it a fun read and give the appearance of fewer words than might be expected in this long a book. 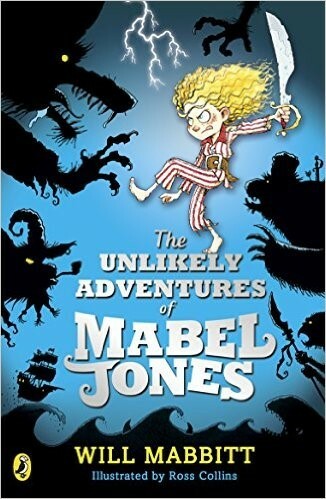 Good readers will devour this story and reluctant readers will stick with it all the way to the end. Pen and ink sketches help the characters and story come alive, though, the text does that extremely well. While there are some misspelled words, as one might expect of pirates, the spellings are phonetic so children readers will translate them happily. Teachers and librarians can introduce this in read aloud form. Literacy skills dealing with fantasy, world building, context clues and character development will all be met within the core curriculum. English teachers can easily use these stories to propel their students’ own writing into the world of the future. Does your big toe hurt? Is the sky red at night? There have been many different myths in various cultures over the generations to explain the weather. While some might be right, many others have been proven wrong by scientists and their research. Accurate weather terminology is used throughout the book with clear definitions where necessary. 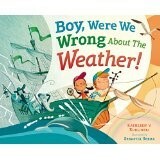 It will be helpful to the youngest students as they are introduced to weather science for the first time. As a read aloud, teachers and librarians can use this in kindergarten and first grade. Second and third graders will be able to read it independently. While they might not recognize some of the ancient peoples mentioned, it is a well done look at myths being disproven by science. It will fulfill core curriculum standards for science and literacy in the elementary grades.